Archibald Bulloch "Archie" Roosevelt (April 10, 1894 – October 13, 1979), the fifth child of U.S. President Theodore Roosevelt, was a distinguished U.S. Army officer and commander of U.S. forces in both World War I and II. In both conflicts he was wounded. He earned the Silver Star with three oak leaf clusters, Purple Heart with oak leaf cluster and the French Croix de guerre. After World War II, he became a successful businessman and the founder of a New York City bond brokerage house, as well as a spokesman for conservative political causes. Archie first attended the Force School and Sidwell Friends School. After being expelled from Groton, Archie continued his education at the Evans School for Boys, and graduated from Phillips Academy, Andover, Mass., in 1913. He went on to Harvard University, where he graduated in 1917. After the end of the war, he worked for a time as an executive with the Sinclair Consolidated Oil Company, as vice president of the Union Petroleum Company, the export auxiliary subsidiary of Sinclair Consolidated. At the same time his eldest brother Ted was Assistant Secretary of the Navy. In 1922, Albert B. Fall, U.S. Secretary of the Interior, leased, without competitive bidding, the Teapot Dome Field to Harry F. Sinclair of Sinclair Oil, and the field at Elk Hills, California, to Edward L. Doheny of Pan American Petroleum & Transport Company, both fields part of the Navy's petroleum reserves. The connection between the Roosevelt brothers could not be ignored. After Sinclair sailed for Europe to avoid testifying, G. D. Wahlberg, Sinclair's private secretary, advised Archibald Roosevelt to resign to save his reputation. Eventually, after resigning from Sinclair, Roosevelt gave key testimony to the Senate Committee on Public Lands probing the Teapot Dome scandal, in which Roosevelt was not implicated, but where Sinclair and Doheny both gave "personal loans" to Secretary Fall. Following this, Roosevelt took a job working for a cousin in the family investment firm, Roosevelt & Son. In the summer of 1932, Archie, former President Calvin Coolidge, former Solicitor General William Marshall Bullitt, Admiral Richard E. Byrd, and General James Harbord, among others, formed a conservative pressure group known as the National Economy League, which called for balancing the federal budget by cutting appropriations for veterans in half. During 1943, following the Attack on Pearl Harbor, Roosevelt petitioned President Franklin D. Roosevelt to put his battlefield-honed leadership skills to worthwhile use supporting the war effort. The president approved his request and he rejoined the Army with a commission as a lieutenant colonel. Roosevelt was given command in early 1943 of the US Army's 2nd Battalion, 162nd Infantry Regiment also called the 162 Regimental Combat Team, (RCT), 41st Infantry Division in New Guinea commanding this unit until early 1944. Working with the Australian 3rd Division, Roosevelt and his battalion landed in New Guinea's Nassau Bay, on July 8, 1943. Overcoming significant command ambiguities between American and Australian forces because of overlapping spheres of operation, Roosevelt played an important role in the Salamaua campaign. His service was recognized when one of the hotly contested ridge-lines northwest of the island's Tambu Bay was named in his honor. This piece of key terrain during the campaign was originally referred to as "Roosevelt's Ridge" to mark the ridge nearest his battalion to higher HQ. Later, it was referred to as "Roosevelt Ridge" as it was depicted in the official American and Australian campaign histories as well as the US Army Air Force World War II Chronology. See left map. On August 12, 1943, Roosevelt was wounded by an enemy grenade which shattered the same knee which had been injured in World War I and for which he had been earlier medically retired, earning him the distinction of being the only American to ever be classified as 100% disabled twice for the same wound incurred in two different wars. At the time of his injury, command of his battalion passed to his executive officer, Major Taylor. Archie returned to his unit in early 1944. For these actions in the Pacific Theater of Operations, Roosevelt was awarded his second and third oak leaf clusters to the Silver Star in lieu of additional awards. Following the end of the war, Archie Roosevelt formed the investment firm of Roosevelt and Cross, a brokerage house specializing in municipal bonds. It is still a going concern with offices in New York City, Providence, Buffalo and Hartford. In 1953 he joined the Empire State Society of the Sons of the American Revolution of which both his father and elder brother had been members. During the early 1950s, Archie became affiliated with a variety of right-wing organizations and causes. He joined the John Birch Society and was the founder of the Veritas Foundation, which was dedicated to rooting out presumed socialist influences at Harvard and other major colleges and universities. 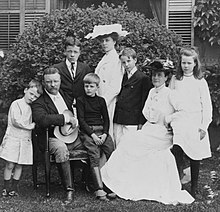 Writing in the book America's Political Dynasties (Doubleday, 1966), Stephen Hess commented: "Archie Roosevelt has, in recent years, added the family's name to many ultra-rightist causes. As a trustee of the Veritas Foundation he was a leader among those seeking to root out subversion at Harvard. He also sent a letter to every U.S. Senator, stating 'modern technical civilization does not seem to be as well handled by the black man as by the white man in the United States.' Present civil rights difficulties he blamed on 'socialist plotters.'" Roosevelt also edited 1968's incendiary Theodore Roosevelt On Race, Riots, Reds, Crime. He was also the chief sponsor behind "The Alliance," a short-lived organization of the 1950s. In 1954, when the Theodore Roosevelt Association made a decision to award the Theodore Roosevelt Medal for Distinguished Public Service to black diplomat Ralph Bunche, Archie loudly protested the award. He even went so far as to write and publish a 44-page pamphlet that attempted to prove Bunche had been working as an agent of the "International Communist Conspiracy" for more than two decades. In his introduction to Zygmund Dobbs's The Great Deceit: Social Pseudo-Sciences (Sayville, NY: The Veritas Foundation, 1964), Archie wrote: "Socialists have infiltrated our schools, our law courts, our government, our MEDIA OF COMMUNICATIONS.... the Socialist movement is made up of a relatively small number of people who have developed the TECHNIQUE OF INFLUENCING large masses of people to a VERY HIGH DEGREE." Roosevelt's grandson is Tweed Roosevelt (b. 1942), who is the chairman of Roosevelt China Investments, and is the President of the Board of Trustees of the Theodore Roosevelt Association. ^ On right wing politics, see citations below related to the section "Right Wing Firebrand". ^ Stephen, Hansen. "InTowner Publishing Corp. » The Force School: Alma Mater to Presidents' Son, a Count, and a World-Famous Aviator". Retrieved 19 December 2018. ^ Theodore Roosevelt (1916) A Book-Lover's Holidays in the Open. New York: Charles Scribner's sons. ^ "Scandal?". TIME. January 28, 1924. ^ "HEROES: Again, Bonuseers". TIME. September 12, 1932. ^ "National Affairs: Economy Lobby". TIME. January 2, 1933. ^ HyperWar: US Army in WWII: CARTWHEEL-The Reduction of Rabaul. Ibiblio.org. Retrieved on 2011-06-12. ^ Army Air Forces in World War II Archived 2009-02-12 at the Wayback Machine. Usaaf.net. Retrieved on 2011-06-12. ^ Roosevelt & Cross Inc. – Specialists in Municipal Bonds, since 1946. Roosevelt-cross.com. Retrieved on 2011-06-12. ^ Stephen Hess. America's Political Dynasties. (Doubleday, 1966.) pp. 137–38. ^ Daniel Bell, Editor. The Radical Right, Third Edition. (New York: Transaction Publishers, 2001), p. 333. ^ Edward Renehan. The Lion's Pride. (Oxford University Press, 1998). p. 244. ^ Zygmund Dobbs. The Great Deceit: Social Psedo-Sciences. (Sayville, NY: The Veritas Foundation, 1964.) p. vi. ^ Leary, Warren E. (10 April 1992). "Explorers of Amazon Branch Retrace Roosevelt Expedition". The New York Times. Retrieved 18 October 2016. "Archibald Roosevelt". Find a Grave. Retrieved 2008-02-09. This page is based on the Wikipedia article Archibald Roosevelt; it is used under the Creative Commons Attribution-ShareAlike 3.0 Unported License (CC-BY-SA). You may redistribute it, verbatim or modified, providing that you comply with the terms of the CC-BY-SA.